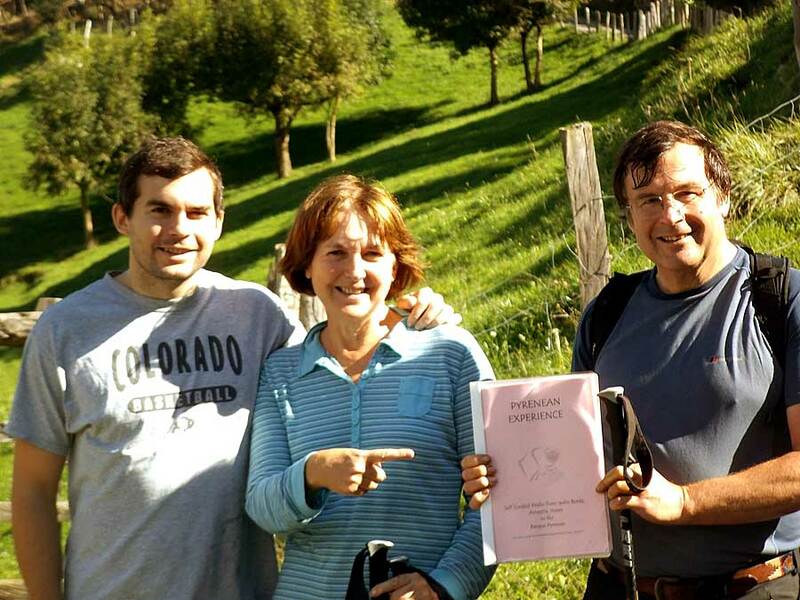 Our self-guided walks in the Pyrenees were pitchforked into action after a phone call from a Houston lawyer around Christmas 2012. 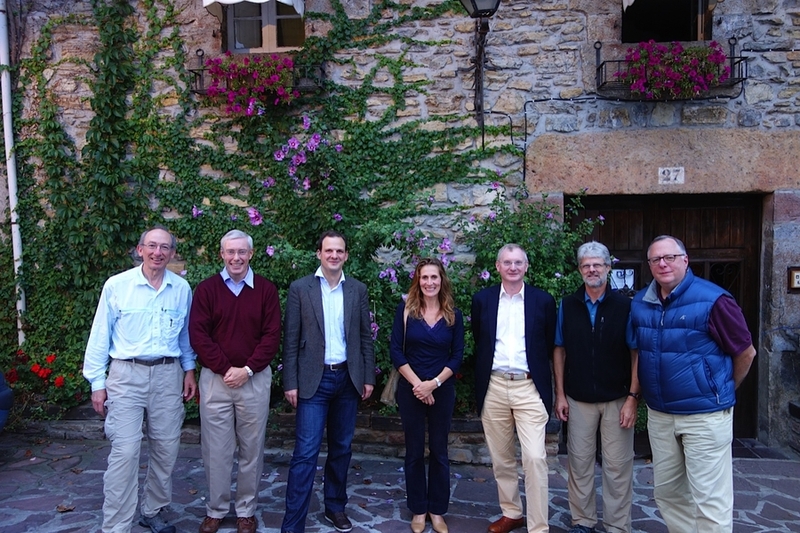 Steve was heading to the Basque Country with a group of lawyer friends and wanted me to design 6 days of self-guided walks in the Pyrenees to lead them over the highest peaks in Basque Navarre, each day including the best Basque fare these valleys could offer! Steve’s self-guided walking group 2013 (me in the middle). I took up the challenge, (one does when one is self-employed). I put myself down for a GPS course and, with the help of another local expert we took to the hills. (I also took the precaution of buttering up my own lawyer partner, Iñaki, just in case his services were required!). I had nightmares about confusing my ‘left turns’ with my ‘right turns’ and waking up one morning to a TV report on how a group of US lawyers had been seriously injured after falling from the summit of Mendaur (a 1100 m mountain in Ituren) after erroneous instructions from a mysterious English woman. Steve – take no offence – but I heaved a huge sigh of relief when Francisco, my taxi driver, bundled you off (intact) on the final day for a meal at Arzak in San Sebastian! Mission acomplished. 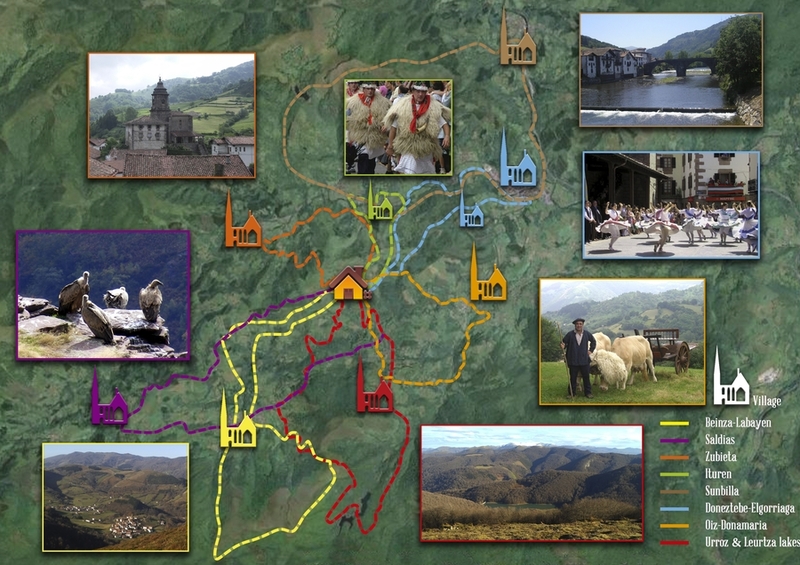 Our self-guided walks in the Pyrenees – more precisely in the Basque Pyrenees – have taken off and since then I have meticulously documented, mapped and GPSed around 200 kms of circular walks in the Baztan Valley area. All of which start and finish from our farmhouse door in the village of Ituren. This is SLOOOW TRAVEL at its best, with no need for a car all week. Juantxo (our builder) was sent out to clear the occasional path and Mike and John, guests on our walking holidays, have been out with orange markers to indicate some of the turns. Alistair, a geologist friend, deserves mention for his patience with the maps. 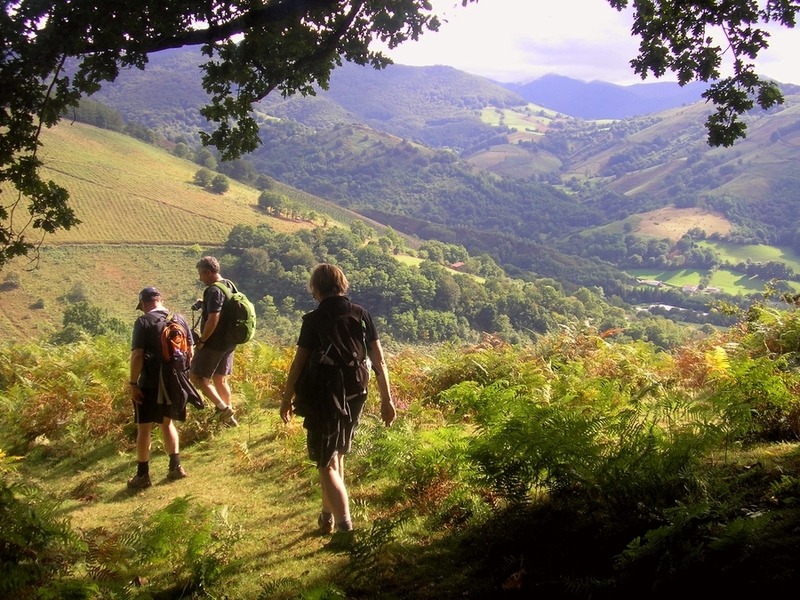 We are extremely lucky as this part of the Pyrenees escaped glaciation and its intricate lie of the land, folds and hidden stream valleys dotted with Basque villages and isolated homesteads gives each of our walks its own individual personality. Views, fauna, flora and mediaeval Basque landscapes change at every bend. 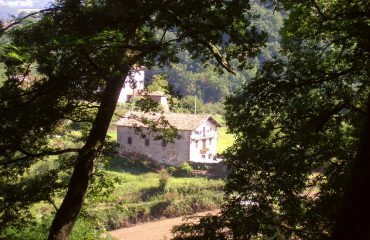 Most of the walks pass through different villages (at least 7 are within walking distance) where local inns serve great Basque Menus del Dia, giving an important cultural and gastronomic focal point to many of the walks. These virtually un-known borderlands of the Basque Pyrenees lend a Sound-of-Music enchantment to the walks. The area is covered by a maze of smuggling and shepherding paths which have witnessed a history of political refugees, witches, pilgrims and allied pilots fleeing over its borders, its patchwork of mountain barns and wooded groves offering them refuge. However, one element that complicates our work (and can be an advantage) is the virtual lack of tourism in the area due to political tensions in Navarre. Few walks are marked and we have had to painstakingly document each turn ourselves. Unlike the familiar stiles of British countryside, gates here reflect the imagination of each individual farmer in his attempts to keep wild horses and other animals at bay. Nevertheless around 80% of the land is communal so there is virtually no concept of private land and you have full freedom to roam. These are some of the most charming and unspoiled mediaeval landscapes in Western Europe and they are beautifully tended. The Basques, understandably, are very proud of their land and culture, and village life still preserves Basque traditions, carnivals and fiestas. 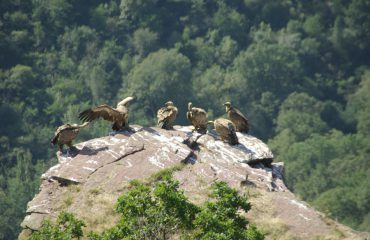 The locals are genuinely friendly and will be curious to know how you ever found your way to their hidden mountain hamlets! Just tell them it is that eccentric English woman from Ituren who has sent you off on her self-guided walks in the Pyrenees and they will smile, and (just in case I did get that left and right muddled up) help you on your way!